This year, Stacey Kiser and I are making some changes to the Honors Invitation to Inquiry seminar to better support the course goals of engaging in undergraduate research and thinking critically about the research process. Winter has two official holidays, and each year we miss two days of class. Since the seminar only meets twice a week, those missed days impact the students’ research projects and our focused discussions on critical thinking. This year, we are experimenting with a Wednesday/Friday seminar so that we can have the maximum amount of time working face to face with the students in class. we also assigned a chapter from Teaching for Critical Thinking: Tools and Techniques to Help Students Question Their Assumptions by Stephen Brookfield. In the past, the class read an excerpt from the first chapter of this book. While this book was written for instructors, the students have done well understanding and applying the portions of the chapter they have read. It seemed reasonable to ask them to read the complete chapter and apply all of that material to their interrogation of academic research. Finally, we have made the ePortfolio work more central to in-class activities as well as work assigned outside of class time. In addition to building and developing ePortfolios, students will be doing more processing and reflecting within their ePortfolios during class. 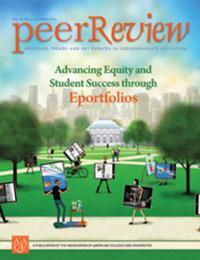 ePortfolios can have an important impact on equity and student success, as addressed in the latest issue of the AAC&U’s publication, Peer Review. These elements align with the college’s strategic directions and with the college’s and the Honors Program’s recognition of the importance of adopting an equity lens and always striving to support student success. Check back for future posts about how these changes worked, student responses, and/or what additional modifications we made to the seminar once we were into the term! This entry was posted in ePortfolios, Seminars, Undergraduate Research and tagged Stacey Kiser on January 11, 2017 by Ce Rosenow.